I will solve it as soon as possible. New Pink Floyd Discovery 16 CD Box Set Sealed. Warm prompt：. This Product is Model. We will do our best to solve all your problems. By normal use, there are very few rubbing scratches.Of course, there is no problem playing. I participate from Japan. So I can provide you the best service. However, I will not tamper with the invoice. Released: 1990 CBS Records Korea. CONDITION CD: NM. 2017 JAPAN PINK FLOYD. MINI LP CD NEW RELEASE. SONY MUSIC JAPAN. ALL CD’S, TAPES AND VINYL ARE UK ORIGINALS UNLESS OTHERWISE STATED. CD’S & 7” SINGLES. VG – VERY GOOD. ALL ARE GRADED BY INNERS FIRST AND THEN DISC. REST OF THE WORLD - £5.00. Title : Maple Prisms. Artist : Pink Floyd. EXCELLENT : Light mark. 中國大陸及香港的買家請在付款後告知中文地址，謝謝。. 台灣買家請在得標後跟我聯絡。. ACCEPTABLE : Many scratches, but still playble. The Thin Ice. Another Brick In The Wall Part 1. Another Brick In The Wall Part 2. Another Brick In The Wall Part 3. Outside The Wall. Young Lust. Goodbye Blue Sky. One of My Turns. ROGER WATERS: IGOR STRAVINSKY'S - THE SOLDIERS TALE (CD). The Soldiers March. The Soldiers March (Reprise). Later That Night. He Doesn't Even Know Himself. The Little Concert - Light Floods The Eastern Sky. English Audio 2CD. 1-2 The Thin Ice 2:26. 1-3 Another Brick In The Wall, Part 1 3:11. 1-5 Another Brick In The Wall, Part 2 3:58. 1-12 Another Brick In The Wall, Part 3 1:14. 2-13 Outside The Wall 1:46. PINK FLOYD LIVE AT POMPEI DIRECTOR'S CUT 2003. A SAUCERFUL OF SECRETS. CAREFUL WITH THAT AXE, EUGENE. Label : Harvest / EMI / Capitol Records USA CDP 7 46001 2. Title : Pink Floyd: The Dark Side Of The Moon. CD Condition : Good (Several light scratches - plays perfectly). Pink Floyd - Animals (1977). Title:Pink Floyd - Animals (1977). Artist:Pink Floyd. Your item will be previously owned but still in great condition. The disc will play perfectly without interruption and the case, inlay notes and sleeve may show limited signs of wear. Digital Remaster. 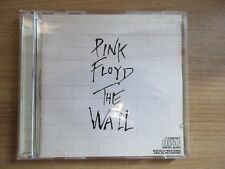 PINK FLOYD: The Wall (2CD). The Thin Ice. Another Brick In The Wall, Pt. Outside The Wall. Young Lust. Goodbye Blue Sky. One Of My Turns. PINK FLOYDPulse Concert Live 2 DVD NTSC. 1-1 Shine On You Crazy Diamond (Concert Version) 13:30. Concert Part 1. Pulse TV Ad. 1-19 Pulse TV Ad 1:05. 2-2 Breathe In The Air 2:50. Concert Part 2. 2-17 The Great Gig In The Sky (Wave) 4:13. 2017 JAPAN PINK FLOYD. THE DIVISION BELL. MINI LP CD NEW RELEASE. SONY MUSIC JAPAN. Shine On You Crazy Diamond. Learning To Fly. Round And Round. Another Brick In The Wall Part II. Run Like Hell. The Dogs Of War. Wish You Were Here. Pink Floyd - Wish You Were Here CD CK 33453 CBS. M or Mint: A CD in perfect condition. The jewel case is pristine. The liner notes, inclusions, and/or sleeve are in like new condition. All CD’s are used unless noted and play with no problem. Pink Floyd - The Wall. The Thin Ice. Another Brick In The Wall (Part 1). Another Brick In The Wall (Part 2). Another Brick In The Wall (Part 3). Outside The Wall. Young Lust. Goodbye Blue Sky. PINK FLOYD - NEW YORK '77 - Not Factory/Official. 1-4 Wish You Were Here 5:34. 2-6 Wish You Were Here 6:13. New / Still Factory Sealed! 1-1 Shine On You Crazy Diamond (Parts 1-5) 13:32. 1-5 Shine On You Crazy Diamond (Parts 6-9) 12:29. Pink Floyd ‎–The Piper At The Gates Of Dawn. BULGARIA SILVER CD. Drums –Nick Mason. CD, Album, Unofficial Release. CONDITION CD EX. CD HAVE SMALL TRACES OF USE. UNOFFICIAL RELEASE! Lead Guitar, Vocals –Sid Barrett . PINK FLOYD THE EARLY YEARS: CONTINU/ATION 1967-1974 SESSIONS. BBC RADIO SESSION, 25 SEPTEMBER 1967. BBC RADIO SESSION, 20 DECEMBER 1967. BBC RADIO SESSION, 02 DECEMBER 1967. A mini LP is a replica of the original vinyl LP; it repeats the design, inserts and everything that the original LP had but in a modern compact size and CD technology. BULGARIAN SILVER CD. Pink Floyd ‎–Wish You Were Here. EMI (2) ‎– 7243 8 29750 2 I,Harvest (2) ‎– 7243 8 29750 2 I,EMI (2) ‎– KJF-31-867,Harvest (2) ‎– KJF-31-867. CD, Album, Reissue, Remastered, Unofficial Release. Pink Floyd / The Dark Side Of The Moon (Japan Edition). Artist : Pink Floyd. Other :Reissue : Mini-LP Replica CD Papersleeve with obi strip : Japanese Liner included. Title : The Dark Side Of The Moon. (4) On The Run. 6) The Great Gig In The Sky. Pink Floyd / Final Cut (Japan Edition). Artist :Pink Floyd. Other :With obi strip : Jewel Case : Liner & Japanese Lyrics included. Your Possible Pasts 3. One Of The Few 4. The Gunner's Dream 6. Title: The Best Of Pink Floyd Echoes. Artist: Pink Floyd. Obi - Very Good. Catalog Number :TOCP-65910/11. Mint : The item has been opened but it looks like new. Disk – Very Good. Insert – Very Good. Kiya Japan is founded in Tokyo, Japan in Aug 2012. Picture sleeves: (-). We are not responsible for each country's custom clearance procedure and custom duties. SPECIAL NOTE: (-). Expedited: Per 1CD ⇒ USD 2.5. ORIG SILVER 2CD. PINK FLOYD - MR.PIG. Pressed in Japan for the Australian Market. Disc Condition: Good condition CD with a couple of scuffs and marks. Plays perfectly. Scans are of actual CD for sale. Пинк Флойд. СМОТРИТЕ МОИ ВСЕ ПРЕДМЕТЫ ! для вашей коллекции.